From 27-29 September 2013, in collaboration with the British Council, FutureEverything delivered the first ever art hack in Moscow. FutureEverything has worked with the British Council (BC) for a number of years, in numerous different parts of the world; last year, Drew Hemment (Founder and CEO of FutureEverything) attended Krasnoyarsk's 2nd International Media Art Festival as part of a BC delegation. - Bring together innovators from the creative and cultural industries and digital technologists, through a targeted selection process. - Encourage innovative thinking around salient issues and challenges currently faced by local creative communities. - Enable low-risk digital prototyping, open data discovery and new working relationships. One of the key elements of FutureEverything’s work is to apply bespoke design methodologies and practices to cross sector creativity, interfacing with science, technology and research, i.e the grey areas in between. We believe the fringes are where innovation happens, and that the UK's creative sector is extremely well placed to play a leading role going forward in the modern, digital economy. The hack took place at Strelka (Institute for Media, Architecture and Design), located within Red October, Moscow's creative cluster. Culture Shift Russia: Art Lab was a 3 day programme of workshops, talks, socials and a 30 hour hackathon. We worked with the Polytechnical Museum, the Russian State Library, Nikola-Lenivets Park and ZIL Cultural Centre to open up and provide new data for the selected participants to work with over the weekend. The event sold out before we’d even started publicising it, and clearly demonstrated a desire and need for events like this in Russia. We stopped taking registrations when we received 200 applications, then sifted through carefully to pick out 50 participants with diverse and complementary backgrounds and skills. Working closely with Strelka Institute for Media, Architecture and Design, the programme was littered with workshops and film screenings to keep everyone’s minds fresh and energy levels up. We had a Makey Makey workshop, a 3D printing showcase and an artist talk and performance from the incredible Dmitry Morozov.The vast majority of the participants worked all through the night on their prototypes, pushing hard towards the deadline on Sunday. Developing this project in Moscow brought with it a steep learning curve for all of us working on it, and for our organisation. The feedback so far has been excellent, and it was an honour to be able to develop and deliver such an event. Tom Higham is Executive Producer at FutureEverything. We spent a long time developing an environment that would encourage and stimulate collaboration and communication, between groups who do not typically work together. This was, in fact, the main goal of the project. 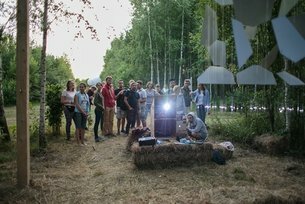 According to our research and Russian collaborators (Alexey Shcherbina from MIGZ, BC and Strelka Institute, the host organisation), the culture of cross-sector collaboration in Moscow still has some way to develop. What happened at the event felt very special, with participants immediately opening up and networking well. It turns out networking bingo might well have been a master stroke... thanks to Dave Mee (one of three mentors) for the format suggestion. The data provided by the cultural partners was fascinating and varied, ranging from collections data, to audience figures, to finances and architectural plans. This will understandably vary from context to context and country to country, and we will release more information about some of the excellent prototypes developed during the hack shortly, but the focus of this first Moscow Art Lab was most definitely on the relationships. We believe that a hackathon should form **part **of a process, not engulf the entire process itself. A hackathon is an intensive idea-generation and prototyping process, and it is unreasonable to expect finished and ‘market ready’ products and apps to come directly from it. That isn’t to say that some of the prototypes won’t live on after the event and develop into something sustainable, but that’s a bonus rather than a requirement. The winner of best overall was a hack called Visual Silence. It was a response to a major problem in the design and usability of the Russian State Library for most audiences. The beautiful building is defaced by numerous scrappy pieces of A4 signage all over the place, stuck to walls with a variety of different point sizes and typefaces trying to explain how some of their assets and resources are indexed. The group felt that the library was cluttered, unfriendly, and the signage and interpretation took away from the experience of the incredible building. As a response they found a technique of polarisation, borrowed from old and cheaply available LCD monitors. By extracting the film from the LCD monitors they were able to create architectural and beautiful light boxes that double as interpretation panels when viewed with the special glasses they created. The team comprised curators, furniture makers, programmers and designers. One of the cultural organisations which released data for the Art Lab was the Russian State Library in Moscow. The focus on collaboration and communication runs through to some of the strategic impact we hope to have generated with the event. Four major cultural organisations were engaged in developing the Art Lab and asked to release as much interesting data as possible. They were the Russian State Library, ZIL Culture Centre, Nikola Lenivets Park and the Polytechnical Museum. While these organisations are all very different in terms of the extent to which they engage with technology, innovation and their local communities around them, the event made a huge impact on them. We anticipate that for any future iterations of Culture Shift in Russia bringing on board significant cultural institutions will be much quicker and easier, as the ground has been broken. Judges participated from education, policy, art and commerce, including organisations like Interactive Lab, Dream Industries, Garage Centre for Contemporary Culture, Moscow Manege and Yandex. We met some incredibly talented artists, architects, developers, designers, sculptors, choreographers and furniture makers who took part in the programme. It really was a very diverse and razor sharp group. We’re developing more projects in Russia with the British Council and can’t wait to return! YCE 2013 Screen & Multimedia winners announced!